California is in a severe drought – four years long now. But what does the drought really mean for the things we care about: food production, fisheries, industrial activities, rural communities? As part of the work of the Pacific Institute to evaluate both the impacts of water problems and identify smart solutions, we’ve just released the first comprehensive assessment of the actual impacts of the drought for California agriculture. Many commentators and analysts have worried especially about California’s agricultural sector, which is a major water user and has experienced significant cutbacks in surface water deliveries over the past few years as rainfall has plummeted and reservoirs have been depleted. 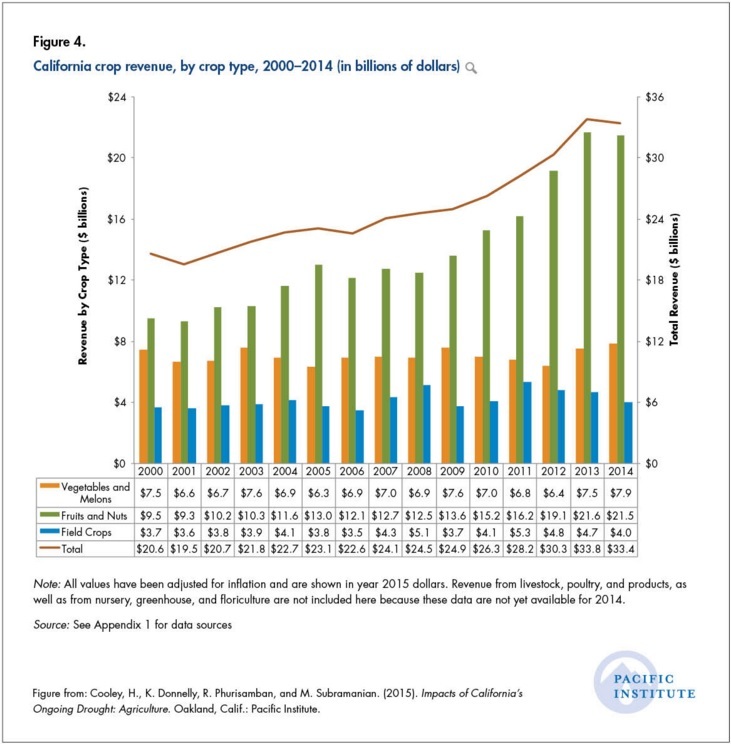 The bottom line of our analysis is that California agriculture has had record revenue and employment during the drought, but at a long-term cost of massive groundwater overdraft and other practices that cannot be sustained into the future. Farm employment (Figure 2) has also increased in every year since 2010 by an average of 9,000 jobs. While the annual increase in 2014 was less than in other years during the drought, total 2014 agricultural employment reached a record-high 417,000 people. Finally, food prices also appear to be largely unaffected by the drought. The US Department of Agriculture projects that retail food price inflation this year will be normal to slightly lower than average due in part to the strength of the U.S. dollar and lower oil prices. massive increases in unsustainable groundwater pumping. Pressures on California’s water resources are not merely a result of the drought. Rather, the drought is highlighting water management problems that have persisted for decades. For example, it is widely recognized that groundwater pumping rates, even in good water years – are unsustainable in some major agricultural centers, such as the Tulare Lake and southern San Joaquin River hydrologic regions. Continued groundwater overdraft, while reducing the economic impacts of the drought for the agricultural sector now, has shifted the burden to others, including current and future generations forced to dig deeper wells or see their community wells dry up, find alternative drinking water sources, and repair infrastructure damaged by land subsidence. In these areas, pumping will ultimately have to be slowed and recharge expanded to bring these aquifers back to a more sustainable balance. The Pacific Institute study finds that the measured impacts of the drought on California’s agricultural sector through 2014 were less than expected, but if the drought continues overall impacts will expand and worsen. The study concludes that evaluating both the actual impacts of the drought on California agriculture and the policies put in place to respond to the drought offer important insights into “how the state can maintain a healthy agricultural sector in a future likely to see less water, more extreme weather, and greater uncertainty.” The protracted drought provides policymakers, farmers, and agriculture officials a unique and urgent opportunity to plan for and implement more sustainable water use policies and practices to support a vibrant and sustainable agriculture sector in California.